If you’re managing your Hashimoto’s yet still waiting for your depression to lift and your memory to return, you could be suffering from the beginning of a brain breakdown. Scientists call it accelerated brain degeneration, and it’s critical you know about it. Many symptoms of brain decline overlap with Hashimoto’s hypothyroidism so that patients—and their doctors—often ignore the symptoms, treating them as just one more thyroid issue to live with. Unfortunately, this is a common mistake with regrettable consequences since researchers have found Hashimoto’s and hypothyroidism increase the risk of developing Parkinson’s or Alzheimer’s disease. In fact, accelerated brain degeneration is one of the most severe consequences of poorly managed Hashimoto’s hypothyroidism. The most common symptoms of early brain degeneration—depression, fatigue, and loss of motivation and drive—are identical to hypothyroid symptoms. Other familiar symptoms include brain fog, an inability to find the right words, memory loss, and slower mental speed. Fatigue is especially common, making reading, driving, or just carrying on a conversation exhausting. Thyroid patients may also experience loss of balance, vertigo, numbness and tingling in different parts of the body, tinnitus (ringing in the ears), and other neurological symptoms. These are all complaints frequently expressed on thyroid internet forums, such as Facebook’s Hashimoto’s 411 group, and in the emails we receive. altered brain chemical function (neurotransmitter activity). loss of blood-brain barrier integrity (leaky brain). brain ischemia (lack of blood flow and oxygen to the brain). increased protein aggregation, a clumping together of proteins in the brain. Tremors usually occur later in the development of the disease, when it may be too late to reverse the damage. frequently losing everyday items, such as the car key or cell phone. If you have been diagnosed with hypothyroidism and notice any of these symptoms, please immediately focus on improving your brain health. Once a person is labeled a “thyroid patient,” doctors blame brain symptoms on hypothyroidism and ignore effective strategies that support brain health. One thing I have learned in teaching seminars to all kinds of health care practitioners, conventional and alternative, is that knowledge about the brain is limited to general recommendations, such as prescribing fish oil supplements or antidepressants. 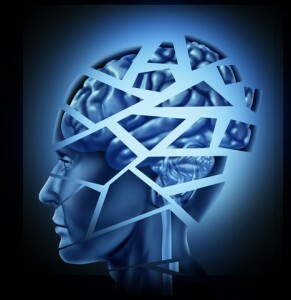 As brain degeneration goes unaddressed, symptoms worsen, causing considerable worry and stress for the patient. I recently published Why Isn’t My Brain Working?, a book about protecting the brain from degeneration. 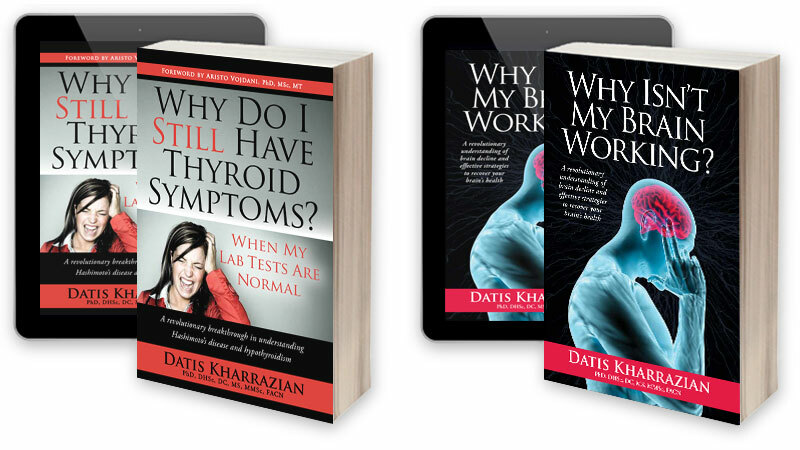 One reason I wrote the book was to help readers of Why Do I Still Have Thyroid Symptoms? understand the critical link between the thyroid and the brain and how to support healthy brain function wile managing their thyroid disorder. You have a window of time in which to turn brain degeneration around. I believe that knowing what to look for and what to do about it can help save your brain before it is too late. That’s why my brain book is a must-read for people with a thyroid condition, especially those who notice a decline in any aspect of their brain function. Each chapter of Why Isn’t My Brain Working? begins with a symptom list associated with a neurologic mechanisms and includes strategies to support that particular aspect of brain health. This type of organization can help you identify which symptoms and signs apply to you and what to do about them. If you are managing your autoimmune condition and taking thyroid hormone medication but still suffer from depression, fatigue, and loss of motivation, consider evaluating and supporting your brain health. I encourage you to read Why Isn’t My Brain Working? At this point in my career, I realize I need to educate patients directly since so few practitioners can help them. I hope my brain book empowers you to improve your brain health and gives you the knowledge to take charge of it. What types of test are there in the medical field to see if you have any issues with your brain. I too have Hashimoto’s. Thanks for any more info you can offer me. You can use Cyrex labs testing to see if your immune system is attacking any parts of your brain. I believe it’s array 5 that tells you what other areas of the body your immune system is attacking. There aren’t really specific lab tests. Markers for inflammation, gluten sensitivity, leaky gut, anemia, high or low blood sugar, and others can clue you in to whether you might have some brain issues. Those are discussed in the book. You can also look at the neurotransmitter questions and see whether those apply to you. Most of the chapters start with questions and symptoms. Thank you for confirming my symptoms. Do you have feedback regarding the use of neurotherapy, specifically LENS, and whether it can help or hinder? With multiple sensitivities, and many years of struggling, I experience paradoxical effects with most all modalities and nutrients and am fearful of further degeneration. Any other suggestions as to what helps? I have asked and do not but know neurofeedback has helped many people. Don’t know if it’s similar. Thank you for this article. I have hashi’s and I’m menopausal. I take Efra 60mg (2 at 5 am with 2-200mg of selenium and 1 at noon…roughly 7 hours a part) I also use bioidenticals and an adreanal support HDEA (? )(I think…at work so I cannot run for the bottle). I take zinc, have a monthly vit B shot, Vit D3–4000mg. Gave up gluten four years ago, caffiene is gone, I quit smoking 5 years ago and my diet is pretty clean…I’m stupid about watching my sugar intake and I don’t eat a lot of grains. Well, it’s been two years now and that mental spark that I had, that quick wit that I had…..is gone. And this to me is very worrisome. Is it the menopause? Or the hashi’s and is there anyone way to tell the difference? I currently live in the arctic and will not be down in s. Canada until next summer. Until then I rely on blood test are faxed to my doc in the south and he makes what ever adjustments he thinks are necessary….email is how we treat me while I’m up here. Any thoughts or comments would be appreciated. I’ll contemplate buying the book bc I’d really like to know what current research says. Deirdre i think the brain book can help remove a lot of mystery and give you some real-world tools you can work with. If you peruse the drknews.com website you will find lots of information about how to support brain health. And, if you want to read any of Dr. Kharrazian’s books but don’t want to spend any money, many libraries offer them on inter-library loan. What is the possibility that Disautonomia could be caused by gluten intolerance or multiple food intolerance? A teenage girls suffers from this condition and I am hoping your protocols would help. Thank you. The possibility is high. 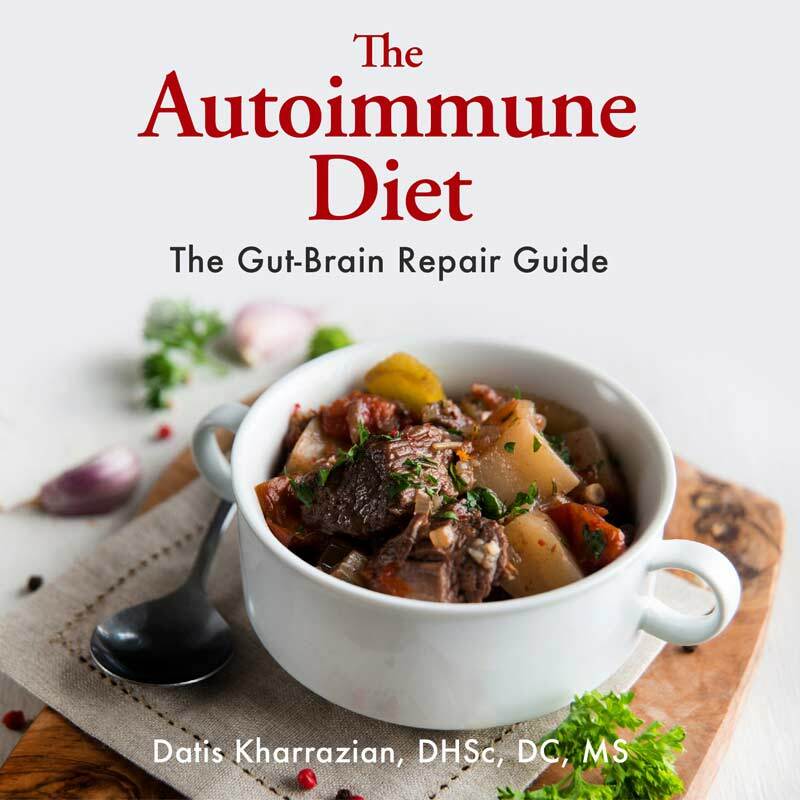 In the brain book he explains how studies show brain and nervous tissue is the tissue most often affected by gluten sensitivity. The autoimmune/leaky gut diet should always be used to dampen inflammation and ferret out food intolerances. What is very interesting to me is that the symptoms you list above are also symptoms of Lyme disease and Bartonella disease. I was diagnosed with Hashimoto’s over 20 years ago but wasn’t diagnosed with the other infections until four years ago—however, we believe the Lyme and Bartonella infections came MANY years before the Hashimoto’s diagnosis. I’m wondering if there has been any research done to see how many patients with a Hashimoto’s diagnosis have been tested for Lyme disease? I do know, from the Lyme blogs I read, that MANY of those with Lyme disease, also have Hashimoto’s! One thing that isn’t discussed is the source of all of these autoimmune diseases, including hypothyroid. If you’ll check out Dr. Tent’s You Tube video lecture series, he discusses the Exploding Autoimmune Epidemic and traces the root to vaccines such as childhood polio vaccines, which contain many animal viruses that attack your thyroid. It is the animal viruses in the vaccines that have been administered to us that create many autoimmune diseases, chief of which is Hashimoto thyroditis. Dr. Tent’s nutritional protocols are a godsend to getting the titers for these viruses (EBV, CMV, Herpes 1, 2,& 6 and Parvo)down to negligible levels so that the viruses do not wreak havoc on the thyroid. It is by far the best protocol for overcoming Hashimotos. I have tremors constantly and it is horrible, feel it in my brain and all my body. Do you know what causes this. Also, do you know of a Dr that follows Dr Kharrasian teachings here in a Puerto Rico, I would like to see one but can’t afford to fly to the states it is too expensive with the hotel and all the weeks needed to treat. On Dr. K’s website, he has a list of doc’s that will work long distance. There aren’t any doctors in my area that understand these things and I reached out to one of the doctors on the list and have now taken the first steps to getting help. Reading Dr. K’s books has been very enlightening for me. When I was diagnosed with numerous pollen allergies, I blamed all my symptoms on pollen. When I was diagnosed with Multiple Chemical Sensitivity, I started blaming everything on that. Then I realized Just how many food sensitivities I have and how many of my symptoms are improved when I eliminate foods and rotate whats left. (I have even fewer foods on the anti-inflamatory diet, but that helps a lot). Then I was diagnosed with Hashimotos, and I really started getting confused as to what is what. Unfortunately, I am one of those he describes that reacts to many herbs and supplements, including curcumin (and fresh tumeric). So, I have to purchase one thing at a time and try it. Every once in a while, I hit on something I can take. My most recent symptom that has me concerned is an odd feeling I get in both of my legs. Its kind of like dangling my legs, below my knees, in a jacuzzi without the heat – kind of a bubbly feeling. I used to call it “twinkly legs”, random little feelings kind of like twinkle lights going on and off. It happens most often around 5 to 6 a.m. And is often accompanied by strong cramps in my calves, feet, and toes (pulling them to the side, or somewhere). When I get up, my legs are very weak and the bubbly beeling persists for a while. I’m not sure if it really goes away, and lessens, and I get distracted, until I sit down and think about it and its still there. I have also realized thar I cannot feel air blowing on my lower legs, like from a fan or blow drier, although I can feel the heat from the blow drier, and when I touch my lower legs I can feel that. Anyway, Is this the same thing as “tingling and numbness” (I do have a numb toe which gets worse along with this) that is described in the email I got as a symptom of Hashimotos, or is it something else? On page 438 Dr. K spoke of people with chemical intolerance developing “symptoms that mimic Multiple Sclerosis”. In another part of the book (which I can’t find right now) he spoke of “going on to develop Multiple Sclerosis”. Between dwindling finances and a need to stay away from chemically loaded public places ( the formost of which are doctor’s offices) I am not anxious to pursue another diagnosis. And from what I have read, the treatment is pretty much the same for everything I’m dealing with. I do want to say that glutathione, the diet, and HCL have been really important parts of my personal program. If anyone has experienced the same symptoms in their legs as I described, and knows what it is caused by, I would sure like to hear from you. Thank you for this opportunity to speak and ask. I share a large part of your medical history: Hashi’s (1990), pollen/cat/dog allergies shortly thereafter & sudden onset MCS (2010). I’m not sure about the tingling in your legs. Have you had your B12 status checked? I too am nebulizing glutathione, taking B12 sublingually and would likely benefit from HCl as I suspect I have low stomach acid (but I don’t swallow pills well and that’s not one you wanna get stuck in your throat). Based on our similar histories, I’m wondering (like Linda’s post above), whether you have been evaluated for Lyme Disease? Do you live in a tick-endemic area? Have you ever been bitten by a tick, found one attached to you or had a bulls eye rash? I have been evaluated by a Lyme-literate doc. and he felt that my MCS was due to Lyme Lyme and the other tick-borne co-infections can REALLY take out your immune and detox systems (think chemical sensitivity) and disrupt your endocrine system. The doc. I saw felt that I may have had Lyme long enough that it could have even trigged my Hashi’s way back in 1990. Lyme is thought to trigger autoimmunity. Without antibody testing and a functional neurology exam it’s hard to say for sure. I have a friend with severe chemical sensitivities who experienced the same sensations. When flares were bad she had trouble walking. She has been applying the principles in the brain book and slowly improving. One thing that also helped her was to use a grounding mat as she discovered she is very electrically sensitive. She had to go computer free for several months and keep the electricity off in the house except for a few hours a day to keep the fridge cold. Everyone is different in terms of triggers. I do not know enough about vagal nerve stimulation to answer your question about yawning but it makes sense. I agree singing is not very practical! You may try the gargling too. Basically he says whatever is difficult is what you need to work on. I have the same symptoms in my legs! I have been googling for months now trying to figure it out. Many things can contribute to tingling in limbs, some of which can be serious. I’d recommend seeing a practitioner trained in Functional Medicine to root out the cause of your symptoms. I have a brain injury as well as Hashimoto’s and hypothyroidism. I had a TBI and suffer migraines, insomnia, memory loss, PTSD, and cognitive issues. I wonder if there is a way to know the difference between the brain injury and declines caused by Hashimoto’s? Will the information in this book be beneficial to both? Yes, the brain book can be very helpful for providing more information on brain health, especially if you have had a brain injury. It could be one condition is aggravating the other; thyroid health is really important to brain health and vice versa. No, I haven’t had my b12 checked, but I also take a sublingual B12, some other Bs as well as a B complex. I use liquid sublingual glutathione plus vitamin c that I get from my doctor. Several years ago I did a red blood cell analysis and was low in all the minerals. I started using HCl and did another test and they all went up. And I felt better. I started with one 650 mg. Soloray capsule with a meal and worked up to 6 with each meal, and 3 or 4 with snacks. I read to stop adding when you feel a burn. I never felt it but just didn’t want to take more. Once I couldn’t get capsules and bought horse pill size tablets. I had an awful burn in my gut. They obviously weren’t dissolving where they were supposed to. I have a friend with MCS and Lyme disease. I read about it a couple of times and it just didn’t seem like I needed to look there. I don’t remember ever being bitten by a tic – don’t they usually burrow into your skin. Can you be bitten and not know it? I have children with MCS and food sensitivities, so I assumed I carry a genetic tendency toward low glutathione as described in the book. I have a question for Elaine, if you are still around. I’m am working up to making myself do the vagas nerve exercises. Years ago I took voice lessons, and the teacher told us to yawn to strengthen those muscles in the back of the throat used in singing. Would yawning off and on all day be as effective as singing loudly? I enjoy singing, but singing loudly takes a lot of energy and can’t be done anywhere like yawning can. I have been trying it and am left with a mildly sore throat, so I guess I’m out of shape! I am enjoying listening to the podcasts of interviews with Dr. K. I’m slow, but am gradually making sense of some of the details I didn’t understand about neurological autoimmunity. 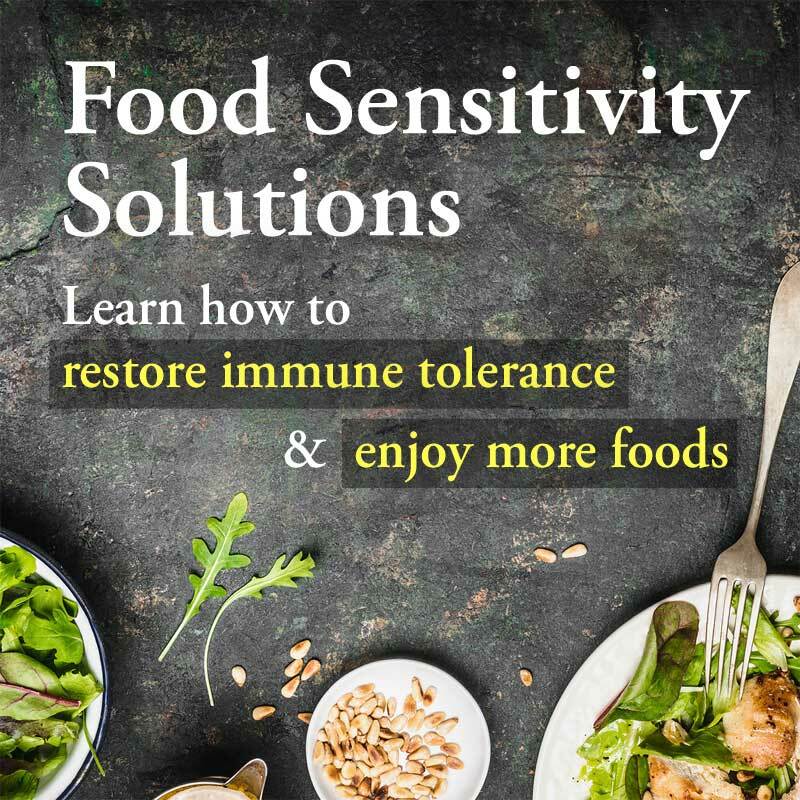 Its very difficult to avoid things that trigger autoimmunity when you are sensitive to nearly every other thing out there. My reply went into the comment above. I guess that if you have those symptoms it is better to try hormone suplmentation (dessicated thyroid for example) and only if it did not reverse the brain symptoms then and only then to suspect some kind of brain damage, true?. I am asking because I do have the symptoms but I don´t take meds because I don´t have a doctor that can treat me. Dr. Kharrazian, PLEASE HELP!!! I have a young adult son with profound clinical depression. There aren’t any “objective” reasons for the depression: Loving attentive family, no abuse, no bullying growing up, really just the more typical stuff kids go through in middle school. But, he has been extremely depressed since ~ middle school age. I suspect that there are physiological caused for his depression, but where to begin? He’s extremely intelligent, has high expectations, can’t “get out of his own head”. He graduated w/ excellent grades from a top tier University, but lacks confidence, so he’s not even looking for a job. He has moved back home So I can better control what he eats. (Prior to moving home, he had been experiencing Cyclic Vomiting Syndrome for the past 2.5 years. I don’t know that the diagnosis was correct, because he hasn’t experienced CVS one since moving home in early June. But, he clearly has a very strong brain-gut response). My Husband & I focus on Paleo, with high omega 3’s from grass fed sources… organic salads, encouraging exercise. He sees a fabulous Psychologist 1x week. My question is, can you think of any underlying medical…causes/ possible deficiencies for his depression? Could Hypothyroidism cause this? I’m going to have him tested for Hypothyroidism and food allergies. Any other ideas of what to test for? Also, do you think your brain book could help in his situation? THANK YOU, SO MUCH!!! I was diagnosed with Hashimoto’s in 2005 with a combination of hypo and hyperthyroid systems, but the hyperthyroidism won. I never experienced just hypo, but I did experience the brain fog. The depression immediately lifted once I went on an allergy elimination diet. It was a miracle! I suggest it for everyone who has Hashi’s. Can you explain the allergy elimination diet? Or what you did! I was diagnosed with Hashimoto’s Thyroiditis in 2005, and have been receiving typical thyroid hormone treatment with seemingly decent results, with minor adjustments to meds every few years, usually tied to reduction or increase in stress at work. I had what was deemed to be an ischemic stroke last year, which left me partially blind and with certain cognitive issues. MRI shows damage in visual cortex and cerebellum. There was no sign of the blood clot that was the cause, and coag panels came back normal. After the instance that was deemed a stroke, it clicked that I had been having vision problems (without realizing it) for years. I wondered if, instead of a stroke, I had just been having some type of degeneration of my brain over several years, which was suddenly exacerbated. The hospital neurologist said this was not possible. Is there any evidence of a stroke-like occurrence that was actually brain degeneration caused by inflammation? I am ordering the book, but I am a very slow reader these days, and wondered if you could confirm or deny the possibility that my suspicions are correct. Which of Doctor K’s books should I read first–the brain one or the Hashi symptom one?? Start with the Thyroid one. It does a great job connecting the two together and then go to the Brain book for more detail on the brain side of things. Both are great books. I just found the FB page and this blog and I am 50 and was diagnosed with an inactive thyroid in 2000 and also depression. Well my depression is worse some days and I have not been able to lose weight and losing my hair. I have no motivation for things I used to enjoy and being involved in, I am menapausual with incontinuence. I am trying to lose weight, watch what I eat,but have lost my appetite in the past four months, I have not a my monthly period for two months now, I cannot sleep, my legs ache at night and only a hot bath will work. I take 125 of snythroid and and 30 grams of a anitdepressant. I walk ten minutes a night and it kills me at times. I just want some suggestions. I have my blood done recently and everything normal. I forget what I am trying to focus on, my speech do not match my words in the brain and my spelling is terrible, I forget how to spell. I have been teased about it at a job and in community events. It is so embrassing. I laugh it off but it is happening more than not. Switch meds to natural desicated thyroid to see if things improve for you. I was on Synthroid for over 20 years but still symptomatic. I did not know about natural desicated thyroid until 2 years ago and it took asking a few drs to find one that would agree to trial run, and the results have amazed my drs! I got my life back and I will never allow my drs to change me back. It seemed Synthroid did not provide the support I needed and natural desicated thyroid, along with an autoimmune anti inflammatory diet I learned from Dr Amy Myers book about Autoimmune protocol had profound effects. I am back in college with a 4.0 GPA and very happy! Best of luck in healing….definitely can’t urge you strongly enough to give it a try. Deirdre, Yellowknife??? I lived there for 26 years, plus 19 in Alaska I had to move south in the States before I was diagnosed with hashimotos. Just keep researching, its the only way to learn, sorry to the docs but I lost faith in them long time ago. I just ordered the why isn’t my brain working because frankly mine isn’t and this is the only lead so far I’ve got. The one thing that has terrified me all my life has been the prospect of getting Alzheimer’s Disease. My maternal immigrant grandfather had it and I saw a proud, strong man degenerate into someone who could no longer remember how to speak English or even his wife of 58 years. I would rather die than live like that. I feel hopeless and scared. I wish I could find a doctor to help me. I have the brain book, but because of cognitive issues I have a very hard time reading and absorbing information. I don’t think I can figure this out on my own, my brain is just not functioning well enough. I have consulted a functional medicine doctor long distance, but they are not getting to the bottom of things. Susan – If you are not having success with your current practitioner, I’d suggest searching for a new one. Sometimes it takes some time to find the right match. Dr. K is not taking on new patients or adding names to his already years-long waitlist at this time, so I’d suggest going to his practitioner finder page at http://thyroidbook.com/practitioner-locator/ and contacting someone from there. The practitioners on that page are highly trained in his protocols, and some of them may be willing to practice remotely if none is near you. Don’t give up the search; you’ll find someone! When I started his brain book, I too had trouble reading it because of my troubled brain function. Don’t give up, and don’t be hard on yourself for not being able to go quickly. Also, you may be interested in his One to One Save Your Brain program starting in April. 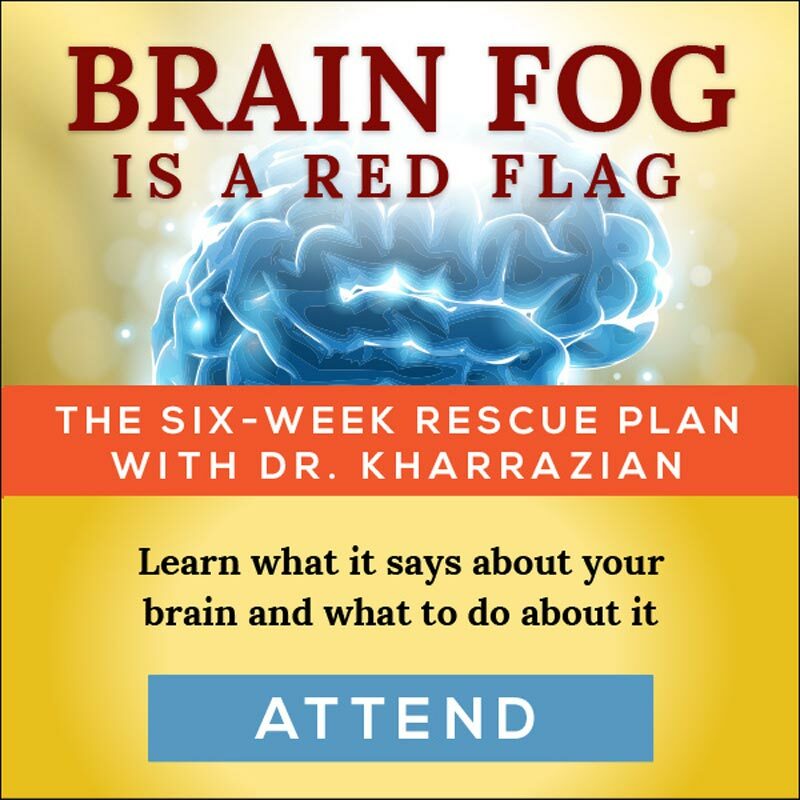 It’s a 6-week course based on the brain book. He launched it last year because he knows many patients have a hard time guiding themselves through the book. Though it’s schedule to be 6 weeks, many members took it much slower, so they could go at a pace that worked for their own brain. We had a great turnout and very positive responses to the 2015 course, and look forward to the next one. If you want info on the course, go to the One to One page and sign up for the newsletter: https://drknews.com/one-to-one/. We’ll be sending out an informational email sometime in the next two weeks. Other than this list, Dr. Kharrazian is not able to recommend specific practitioners, because it is impossible for him to monitor how they integrate the protocols into their practice. If you don’t find someone from the list linked above, I’d suggest getting on one of the large Hashimoto’s forums on facebook, and asking about a local practitioner. You’ll be surprised at how many patients can refer you locally. I’d start with Hashimoto’s 411. Good luck, and don’t give up on your sister; clearly the treatment she is getting is not meeting her needs. This website is not displaying properly on my iPhone 6s Plus. I have iOS 10.3.3. I can’t read any of the articles because half of he page is not adjusting to my screen. Robin; Thanks for the heads up. Our website has been undergoing some revisions. I’ll pass this along to our webmaster. Maybe update to the newest iOS and restart you phone…. update safari.. Not seeing the issue on my devices.